Bring wild birds to your home! Watch them up close. Get to know them as individuals and learn their personalities and quirks. 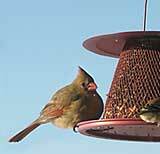 Here are some feeders to delight both birds and people. We ship most of these items by Priority Mail. We ship every day, usually by Priority Mail. Transit time to US addresses is usually 2 to 3 days. A day longer for Alaska and Hawaii. If you'd like to talk to a live human being, give us a call (800-779-7256). We've used these items personally, and we'll be happy to help you make a selection. You can also order online at the Birdwatching Dot Com Store. Attract woodpeckers and other desireable birds. Starlings and jays can't hang on upside down. Yay! Photos of woodpeckers using it! Say No-no! to squirrels with this all-metal, no-wood, no-plastic mesh feeder. Roof protects birds and feed. Metal mesh resists squirrel damage. Made for cardinals, but many other birds love it, too. This cute Red Seed Ball holds sunflower seeds. Fill it, hang it, and watch the birds come. Metal mesh lets seed dry out after rain. Fill it with nyger seed, hang it up, and let your goldfinches entertain you all year around. For friends in warm climates, or for spring... It's adorable. What a cool gift, a hummingbird feeder that sticks to outside of the window with a suction cup. Easy to clean and irresistible to hummingbirds. 4-oz capacity. Birds reach up from a covered platform. Seed stays dry and clean. A thrillto watch after an ice storm! Capacity 4 quarts or 6 quarts. Just a cage at the bottom of the image, not the whole feeder. It's an accessory to the 4-quart and 6-quart feeders, to stop squirrels and big birds from getting in. Open the hinged roof and add mealworms or other bluebird food. Bluebirds quickly learn this is their own feeder. Wonderful for when bluebirds are returning in spring. Made for your convenience and the health of hummingbirds. SO easy to clean! Holds 16 oz. Window hummingbird feeder attaches with suction cups. Red cover attracts hummers. Three ports let three birds feed at once. Detachable moat filled with water keeps out ants! Lifetime guarantee. Bouncing shroud makes squirrels and raccoons give up. Comes in black or white. Double sided, so birds can feed from either side. Weight-sensitive perch excludes squirrels. You can set it to keep out big birds, too. Hang or pole mount (hanger & pole included). Sometimes the number of choices can be overwhelming. So here are Michael and Diane'ss personal choices for the best binoculars, from the least expensive to the ultimate in high-end optics. Here are some of Michael and Diane's favorite birding gifts that are sure to please the heart of a birdwatcher. And if you have questions on any of these items, you can call us at 800-779-7256.